An introduction to Civitavecchia, a resort city that has been Rome's deepwater port for more than a millennium. Civitavecchia is the main cruise and ferry port for Rome, Italy. The attractive resort city of 58,000 is on the coast of the Tyrrhenian Sea, about 80 km or 50 miles northwest of Rome. 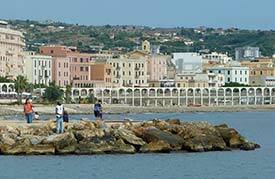 ABOVE: Anglers fish from a rocky point in Civitavecchia with the city's waterfront promenade as a backdrop. Its harbor dates back more than a thousand years, to 101-108 A.D., when Emperor Trajan ordered the port of Centumcellae built to handle deepwater shipping for the Roman capital. During and after the Middle Ages, Civitavecchia was controlled by a series of counts and popes. Several restored medieval and Baroque structures (including the massive Forte Michelangelo and the defensive walls behind the port) are reminders of Civitavecchia's long history. Today, Civitavecchia welcomes more than 500 cruise ships every year. It's also a major ferry port, with regular car-passenger services to Sardinia, Sicily, Corsica, Malta, Spain, and Tunisia. In this article, we'll offer tips on how to get to and from Civitavecchia, where to stay overnight, and how to enjoy your time in the city.